The following diagram illustrates the advanced Veeam ONE deployment scenario. Veeam ONE Server and Veeam ONE Web UI components are installed on separate machines. To enable multi-user access to real-time performance statistics and configurable alarms, you can install one or more instances of Veeam ONE Monitor Client on remote machines. To store data retrieved from connected servers, a local or remote Microsoft SQL Server instance is required as a supporting system. If you already have a Microsoft SQL Server instance that meets Veeam ONE system requirements, you can adopt it for Veeam ONE deployment. Otherwise, you can install a new Microsoft SQL Server instance during the product installation — Veeam ONE setup package includes Microsoft SQL Server 2012 SP4 Express Edition and Microsoft SQL Server 2016 Express Edition. For large-scale deployments (1000+ VMs), is it recommended to use a remote Microsoft SQL Server installation. It is also recommended to run Veeam ONE services on a dedicated server. Such distributed installation will improve performance of Veeam ONE services. The advanced installation relies on a client-server model for data collection and communication. Server component collects data from virtual infrastructure servers, vCloud Director servers and Veeam Backup & Replication servers and stores this data in the database. Web UI component (Veeam ONE Reporter) communicates with the database and allows users to access collected data for generating reports. Monitor Client communicates with Veeam ONE Server directly to obtain real-time virtual infrastructure performance data and data protection statistics. 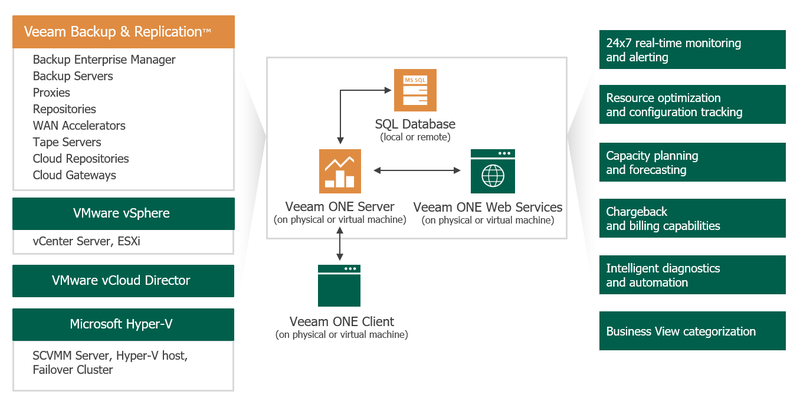 For a successful Veeam ONE deployment, it is essential that the client components are aware of the Veeam ONE Server and the database location, and can connect to them to retrieve and process data. For instructions on the advanced installation procedure, see Advanced Installation.